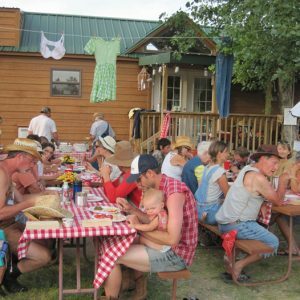 Become the hero of your reunion by staying at Eagle Canyon Hideaway. Your reunion is around the corner, and booking cabins for your friends and family is now the easiest, fastest part of the planning. 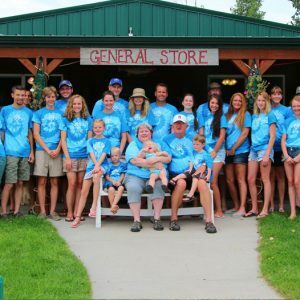 With a variety of cabins, RV sites, and tent sites we have accommodations for everyone. This is also the perfect place for Weddings, Anniversaries, Church and Business groups, or just a vacation with family and friends. Plan your family reunion around a holiday that has special significance to your family. Since many people get off work for some of these holidays, that provides an added benefit. Some holidays include: St. Patrick’s Day, Mardi Gras, Easter, Oktoberfest, Thanksgiving, and Christmas. Make your wedding simple, beautiful, and inexpensive by having a sunset wedding on the beach, or at Eagle Canyon Hideaway. Invitation: Put an engagement photo of the couple on the invitation. Better yet a picture of them at Lake McConaughy. Food: A barbecue, chips, salads, deserts. Have a pot luck, where everyone contributes by bringing their favorite dish. 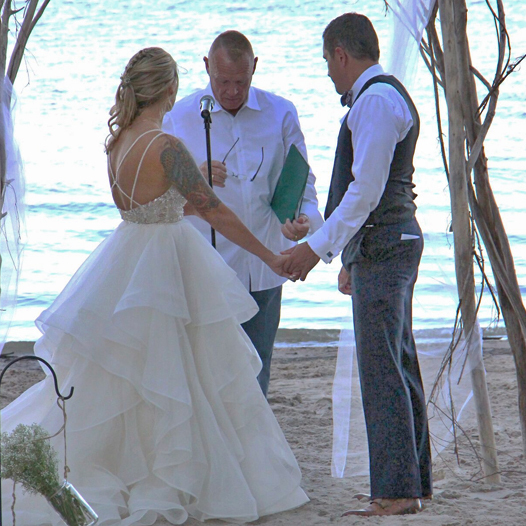 Activities: At a beachside reception, you can play “pass the shell”, where a large shell is passed around and guests “listen” for some advice from the other world. Once they get a piece of advice (really something they think of themselves) they share it with the bride and groom, either verbally, or it can be written into a book for the couple. Decorations: Choose the brides maids colors and decorate the meeting room. An Anniversary with us (a fiftieth, for example) can be a special gift to the happy couple. Invitation: Put two photos of the honored couple on the invitation: their original wedding photo and a current photo. Food: A dinner/dance in the couples honor. Activities: Have the couple renew their wedding vows, have themselves a dance, then surprise them by grabbing a microphone and announcing that they were named the Prom King and Queen. Then give them crowns. Decorations: Photos and other various memorabilia of the couple’s life together. Location: Mexico. No, ha, ha, just kidding. Basically anyplace you can turn into a Mexican fiesta. Invitation: You could go with the basic “You’re invited to a fiesta!” or you could go really wild and throw a little bit of Spanish in there, like, “Hola! You’re invited to a fiesta! Ole!”. Activities: Pinatas, of course, that’s a given. You can really do anything that involves saying something in Spanish, and let’s not forget the Mexican Hat Dance. Just get a big sombrero, turn on the music, and have at it. Games: Tortilla toss. Throw it like a frisbee for distance. Decorations: Sombreros! Sombreros everywhere! Give people sombreros when they arrive and if you can’t afford a sombrero for everyone, just print out a lot of copies of pictures of sombreros, and tape them to people’s forehead as they arrive. And don’t forget the hanging chilies you dragged out of the cellar. Awards: Most authentic Mexican dress, biggest sombrero, brightest sombrero. Also have awards for the Mexican Hat Dance. Can’t afford to go to Hawaii? Well the Hawaiian Luau family reunion is the next best thing. This reunion works best if you have access to a swimming pool, (and we do) or some other place you can get yourself wet. Location: The pool, or at the lake. Food: Pig roast, pineapple, coconut (with half shell coconut glasses). Games: How low can you go? Let’s limbo! Dress: Hawaiian shirts for those who have them, Bermuda shorts, grass skirts. Have someone pass out multi-colored leis (along with a kiss on the cheek) as people arrive. Decorations: Fresh flowers, straw huts, glowing volcanoes, lots and lots of fruits. Awards: Wildest shirt, best hula dancer (complete with the hip swinging), limbo master. If you have some relatives that have trouble fitting in, here’s a great way to give them an excuse. Location: Mars, Jupiter, Neptune any of the basic nine will do. Actually, a good place would be somewhere you could have black light. (our meeting room) That luminescence of white and brightly colored clothing adds quite an extraterrestrial effect. Food: Ah, food. For outer space you could probably throw anything together and say, “It’s a recipe from the Martians. Don’t look at me.” But that wouldn’t make you too popular, so try some of those things that look weird but taste good you know, like tuna fish. Activities: So many activities. You could play just about anything under a black light and people would find it as enjoyable as something new. Musical chairs, for example. Or just give the kids light sabers (Star Wars is popular nowadays) and let em run around. Games: Laser tag is fun. Anything that involves Kill-O-Zap guns or something like that will be perfectly fine for most kids. Dress: Like aliens. You know, those oval-headed green heads with eyes the size of manholes? Those have become popular. Just wear all black and put circular tubes of duct tape around your joints (shoulders, elbows, knees), and wear a mask. Decorations: Flying saucers, glow in the dark stickers, some wall hangings that do that illuminating thing under black lights. Throw in a palm tree and see if anyone notices. Awards: Give a prize for the person who would probably fit in best with a feast of extraterrestrial beings. Then give a prize for the person with such a bad costume that they would end up being the main dish. Try to choose a person with a sense of humor. Everyone likes being chased by lions and tigers, and fighting with mosquitoes the size of cats. Well, get as close as you can by having a safari reunion. Food: Lion meat, tiger meat, monkey meat, tapir meat, snake meat, the usual schmo. You don’t have to tell them it’s really beef or pork. Activities: A lion show. If you can’t get any lion tamers, go to the circus. How about a tree-climbing contest for the kids? Games: You know when you were kids, and you just wandered around acting like tigers? Well, that won’t really work here. Put a little organization to it. Organize a hunt and have someone be a lion (but walking upright) and go hunting for them in our woods. Dress: Well, there’s always the look-at-me-I’m-a-tourist ensemble Hawaiian shirt, Bermuda shorts, black socks pulled to your knees, sandals, a visor and a camera around your neck. Or you could go with the I-know-what-I’m-doing-and-I-look-it outfit pith helmet, khaki safari clothes from Banana Republic, a gun and binoculars. Decorations: Hang vines around, set up a tent in the corner, and get some wild animal stuffed animals. Don’t forget the native totem poles with shrunken heads hanging off the eagle’s wings they’re always a nice touch. Awards: Best safari dress, best tiger wrestler (in case you do get the tigers and lions), best hunter (for the game), and best tree-climber. “There’ll be no accusations, just friendly crustaceans, under the sea.” Ah, the underworld. Made popular by the Hans Christian Andersen story and profitable by the Disney movie, “The Little Mermaid”. Here’s some starters to help you out. Invitation: “Come visit with the Sea Folk,” or something uncreative like that. Or perhaps write out the first lyrics to the Little Mermaid song. Food: Fish sticks (or fish fry with fish you caught at the lake). And I hear kelp has some serious health possibilities. Activities: Go swimming! At the beach! At our pool! And watch the Little Mermaid. It sounds lame, but even adults enjoy it. Games: Pin the tail on the mermaid. Dress: I advise you not to wear the seashell bikini like Ariel does if“ it’s kind of funny looking on you. Just try Hawaiian shirts with seashells on them. Decorations: Seashells, palm trees, fish hanging by strings, and underwater castles galore. Dolphins and sharks and stingrays are rising in popularity as well. Awards: Best dressed mermaid / merdude, first person to scream at the crab in the movie to stop singing, other various categories. A western theme is very popular for family reunions. You even get to dress up in cowboy clothes. Food: Barbecue, baked beans (yipes! Watch out! ), corn on the cob. Activities: Campfire (singing around, roasting), square dancing, a bit of calf roping (with stationary fake calf). Games: Sack race, wheelbarrow race, tug of war, other old classics. Dress: Flannel western shirt and blue jeans, ten-gallon cowboy hats, tall boots, big gold belt buckles with cow skulls and bandannas. Decorations: Various versions of false cacti, cattle skulls, horses, those howling coyotes that are suddenly so popular. So plan your get together now and make a memory that will last a lifetime!